Finally this rare 1978 live recording by Elvis Costello and the Attractions from Toronto sees the light of day again. Originally a promotional-only disc for radio, Live at the El Mocambo was first issued in 1993 as part of the 2 ½ Years boxed set that has since gone out-of-print. Now reissued as a standalone disc, Live captures Costello at the height of his popularity as the king of New Wave. Most of the set list draws from his first two albums My Aim is True and This Year’s Model, and the performances here are explosive such as “Lip Service,” “The Beat” and “Welcome to the Working Week. And even a song that had orginally a slower tempo on the studio album is given a faster, rockier treatment live such as “Less Than Zero.” The band was definitely smoking that day, so much so that at the end of the disc you can hear the crowd demanding an encore! 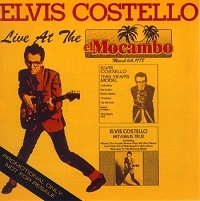 Full of relentless energy, Live at the El Mocambo is a must for fans who love early period Costello.